your ignition trim isn't activating until 90% throttle, try bringing this down to about 60%. Jump into the PCLink help file and search logging. This will give you a run down on PC and ECU logging options. does -10 degrees actually give you enough boost to launch at. Unsure as I'm teaching myself how to do things, but what would you recommend that setting to be? there is no figure carved in stone as many factors contribute to this, engine displacement, compression, turbo charger design, header design etc etc. Normally I find a starting value of -20 gets you underway, but it all comes back to what launch boost your combination can make at what you also need. No use having 20 psi launch boost if you cant get traction out of the hole. once again, right click go to What's This and read through the HELP files everything is in there. If there is something specific that is not covered in the HELP file please advise so it can be added in future releases. What MODE of Launch Control are you trying to setup. Kind of sounds like you are chasing a combination of Launch control and traction control. 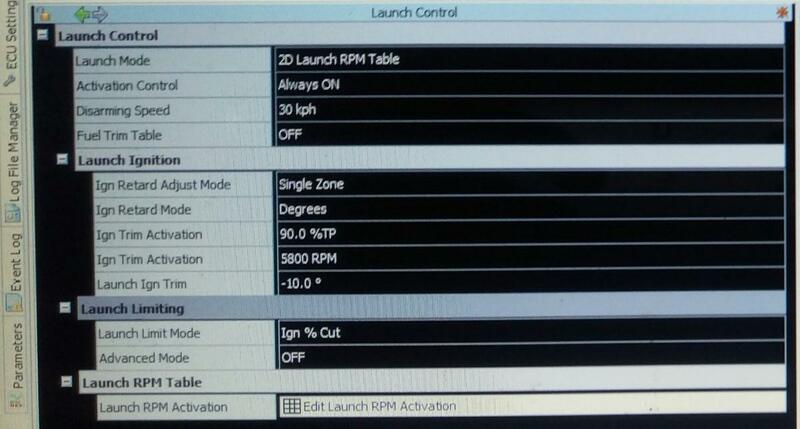 My question asking for what type of Launch control you were trying to set up was, 2D, 3D, Single or Latched mode. As i stated earlier there are no golden numbers anyone can just give you unless they have tuned and setup exactly what you have. Retarding the engine by more than 10 degrees to -20 - 30 or more plus adding fuel trim will add to launch boost and create the bangs and pops you want. Remember LAUNCH CONTROL and ANTI LAG are two very different things. This SHOULD be set up by an experienced tuner.